Years ago….and I do mean years (I was 10) I learned to shuttle knit. Somewhere over the years of knitting I heard that it was the Scottish Shuttle but don’t recall where I read that. Today the Irish Cottage Knitting is exactly the way I knit. It’s the method I prefer because I can knit faster and I also think my stitches are more consistent than other methods that I might use. If you are wanting to learn more about this, you just might want sign up for the class that I will be teaching at Avenue Yarns. You can see an earlier video of me knitting on the Skein Lane website. My recent retirement from my UC day-time admin job of nearly 8 years has been such a blessing. While I’ve never really left the knitting community, I am now diving back into it and the wonderful community that is part of me. Some of you may not know that before my Skein Lane retail chapter, I was an employee of the YMCA for about 18 months and went onto become a Board Member after I accepted a position in the software industry……most importantly I was an active user of the YMCA programs….in particular exercise. I stepped away from this wonderful resource about 10 years ago for a variety of reasons…..mostly my schedule and illnesses in my family. 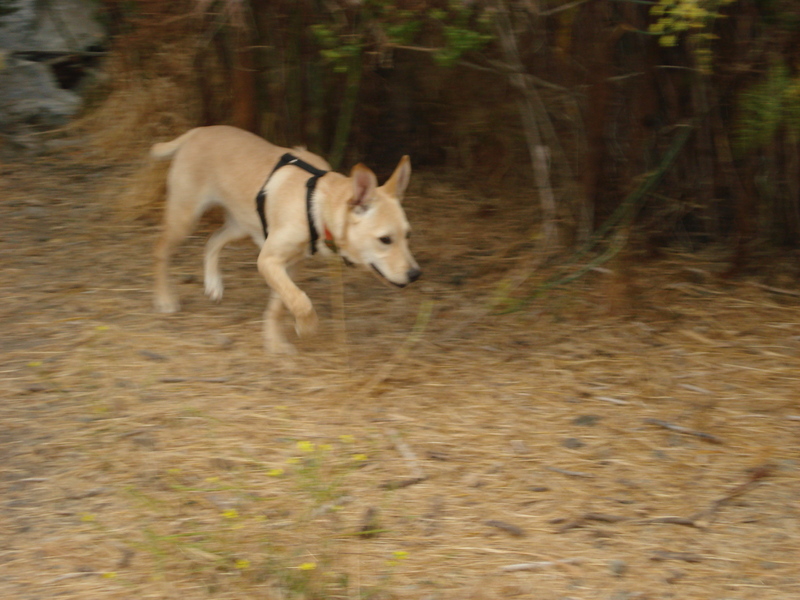 One of my first missions upon retirement was to get back into a regular exercise program. I walked into the Albany YMCA….immediately reconnected with Gail, the Director, and Mary, Exercise and Program Instructor. I was back home! I’ve been enjoying Mary’s creative exercise classes since mid-January. Not only do I feel better but I have lost some weight…yeah! There is another most wonderful benefit….reconnecting not only with Y folks but knitters who are in the Y community. I quickly learned about the (free) Brown Bag Speakers Forum, presented on the 2nd Monday of every month sponsored by the “Y” and Albany Library.. This month’s speaker was Lawrence Rinder, Director of BAMPFA (UC Berkeley Art Museum and Pacific Film Archive). His presentation was so informative about the history of BAMPFA leading up to its new location. Last month’s Brown Bag speaker was Barbara Hazard.….a former Skein Lane customer who spoke about her art work and time spent in Russia. Not only is Barbara an artist with paints but she is obsessed “self-described” with needlepoint. I recall how many lovely pieces she brought to Skein Lane to have finished into pillows. I do wish I had taken photos back then….maybe I did but that was before I had an iPhone camera with all its storage capabilities. But wait….Barbara has posted some of her needlepoint work on her site. I am delighted that we are in the midst of planning when we can catch up over coffee before her next upcoming trip to Russia mid-May. Darn…..I was on a roll with this post and wouldn’t you know I apparently hit the wrong key….ugh…post gone. So, I start again! While the end of this summer has been quiet here on the Skein Lane blog, let me tell you the needles have been clicking. 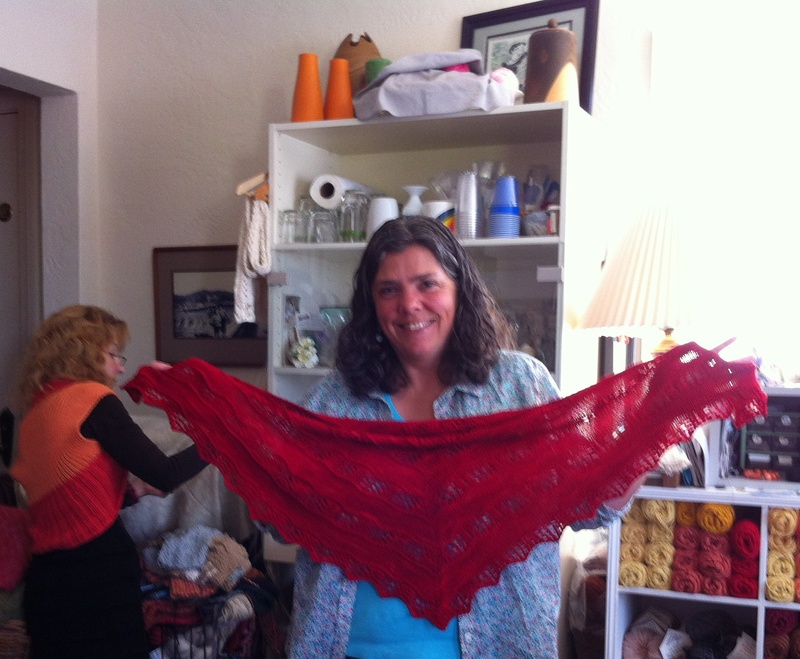 For starters here is what lovely Ellen showed about a week and a half ago at Friday morning knitting….the lovely “Shaelyn” shawl. Ellen takes on the best knitting projects and is always so modest about that. She knit this garment with Sanguine Bryphon “Skinny Bugga” Tomato….unfortunately she tells me that they are out business. But don’t despair…you can be inspired by Ellen and the pattern..and go on to choose your own yarn for this lovely shawl. Ellen will be away from us for awhile as she continues on her nursing journey…we are always so glad when she can come up for “air” and join us! p.s. 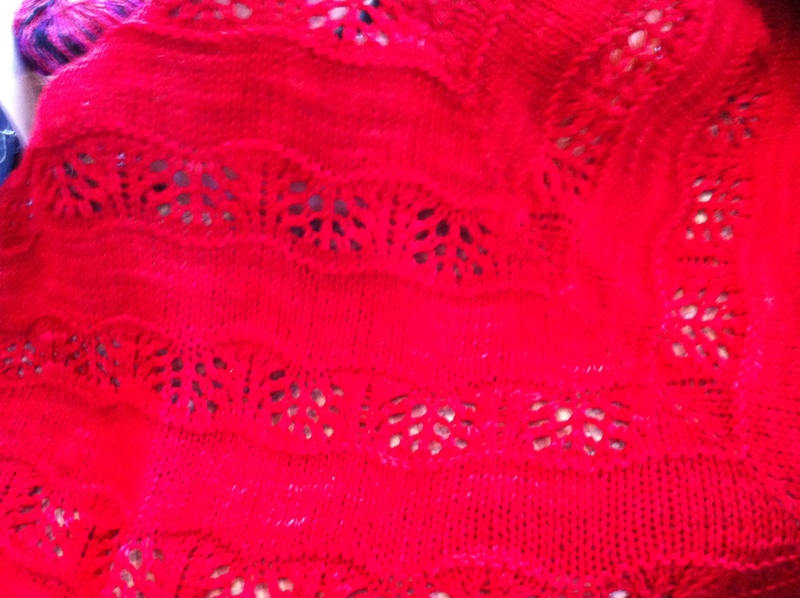 these photos do not do justice to the beauty of the garment and the yarn…so be inspired by what you do see and dream on! Thought I better get a quick post out that Skein Lane is offering a ’tis the Season promotion. This is a chance to get yarn and/or patterns for that last minute gift…..remember the cowl that so many of us have been making…so quick and so lovely. It’s also an opportunity to put that last gift kit together for your favorite knitter. So….from now through Dec 19, you have the chance to enjoy 25% savings at the online Skein Lane store…your coupon code is…lucy. Who better than Lucy Girl to promote the season. Our feet are finally back on the ground after Stitches West and MaggiKnits. It was a wonderful trade show….lots of knitting enthusiam….and great to see so many old acquaintances and friends. Maggie and Julie. who came from the UK to help Maggi, were their creative best helping customers making decisions about garment and color choices. My staff and I helped our customers walk away happy. Many thanks to Sundee, Jan, Merle, and Debbie for all their help! It was a great weekend. And since then many of us have been knitting Maggi designs. 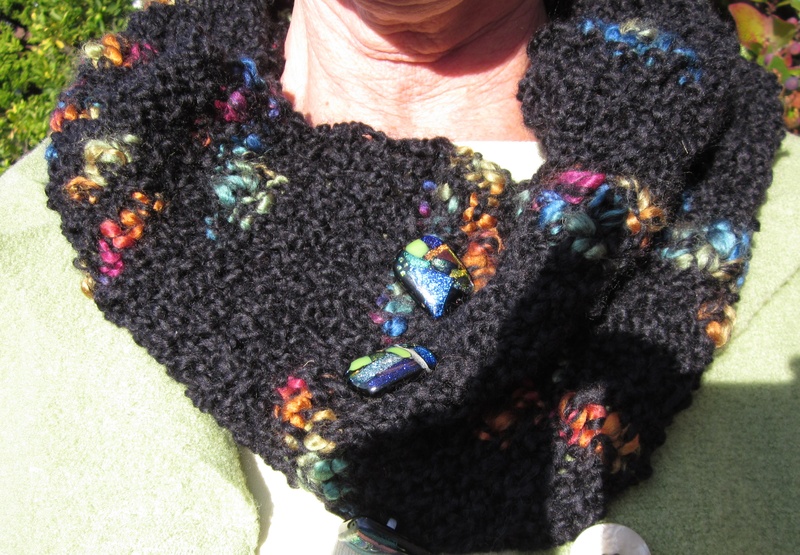 A MaggiKnits knitalong starts on May 2. Check our website www.skeinlane.com for the details. Other exciting MaggiKnit news is that I spent time talking with Pat (and Sharon) from Neighbor Knit Shop in Hendersonville, TN while they were on their way to Stitches South in Atlanta. They were meeting up with Maggi for another weekend of retailing fun. We were both quite excited about the endless possibilities of knitting with Maggi’s yarns. In fact, Pat mentioned that one of her customers is using MaggiKnit’s linen to knit The Classic Shirt from Mother-Daughter Knits by Sally Melville & Caddy Melville Ledbetter. MaggiKnits yarn is here, the kits are prepared, the packing is almost done and Stitches West opens tomorrow. It’s show time folks! See you at the market, booth #728, at the Santa Clara Convention Center. Today has been a very active day sorting through all the various cyperspace connections – blogs, Skein Lane Studio, Raverly, and Facebook. Was able to post something to each site….and in turn heard back from many “Skein Laners” – what a wonderful community. And the knitting excitement re:Stitches continues to grow. I am eagerly awaiting the arrival of Maggi’s yarns for the event….I will try to keep my knitting needles out of the yarn until Stitches is over.